Noah's Ark is lesson 3 in the first quarter of a year of Preschool Bible Study that I assist with on Wednesday evening. We are learning about Noah and his family. Noah is found in the book of Genesis (6-9) in the Old Testament. Noah was faithful to God. He had 3 sons named Shem, Ham and Japheth. God told Noah to build an ark of gopher wood. God told Noah exactly how to build it! God said to add one door and one window. The ark was very big and had 3 floors (levels). God told Noah that He was sending a flood, but that Noah and his family would be kept safe in the ark. Noah was to take a male and female of every animal and keep them alive on the ark. Noah had to take enough food that his family and the animals needed to eat. Noah did what God commanded him. God told Noah to go onto the ark. Noah and his wife, his 3 sons and their 3 wives= 8 people went on the ark. (add it for the students) It took 7 days for the animals to go onto the ark! They went 2 by 2, male & female. God shut the door of the ark when everyone was inside. It rained for 40 days and 40 nights and the water covered everything! The water picked up the ark and it floated. When it stopped raining, the ark came to a stop on Mount Ararat. After 40 days, Noah sent out a (1) raven. Then he sent out a (2) dove, but it came back since there wasn’t any place dry for it to rest. After another 7 days passed, he sent out another (3) dove and it brought back an olive leaf. After another 7 days, he sent out the (4) dove and it didn’t return. That meant there was someplace it could make a home. God told Noah to leave the ark with his family and all the animals. God was happy with Noah and put a rainbow in the sky. God said it is His promise that He would never destroy the earth with water again. Every time you see a rainbow in the sky, it reminds us of God’s promise. I used this ark for the project. They love anything they can carry like this, so it is a lot of fun for the kids. Click here to see how I used this project and to download. 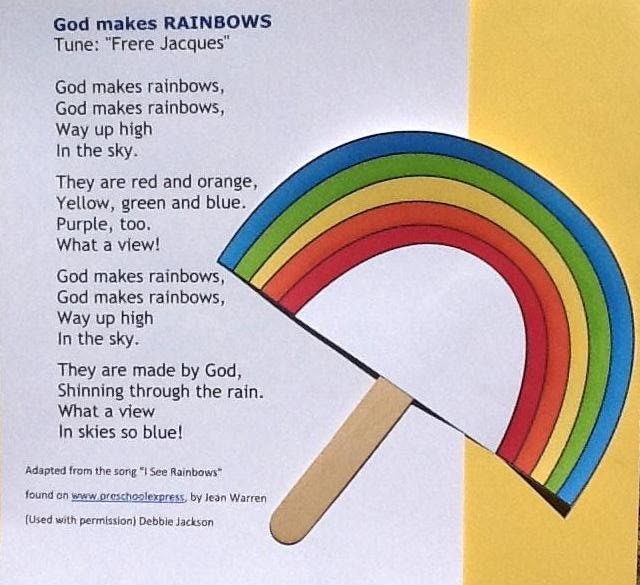 The kids love this Rainbow song! Click here to see it. If you have extra time, after singing God Makes Rainbows, we will point to each color. They tell us the color, then I ask them to name something God made that is that color. The kids love the fun interaction! There are more Noah's Ark preschool ideas and printables here. The kids love holding the animals for this song! We give them a couple of animals each (depending on how many students you have). We point to each person and they pick up their animal on a craft stick for others to see. When we finish singing about each animal, I remove it from the table. Click here to see the early elementary lesson, ideas & printables for Noah. I'm studying Noah and had fun reading your abbreviated version for children. Thanks. This looks great! We just returned from the Ark Encounter in KY. I will be sharing this with my littles!